It's almost time for the promised Sengoku Basara presentations at Jump Festa this weekend! Capcom posted an update last night to advise that the start time will now be 13:30 - ten minutes earlier than previously stated. The presentations are still scheduled to last just half an hour each. In addition, there's been a last minute announcement which confirms that seiyuu Okamoto Nobuhiko (Shibata Katsuie) will be joining KobaP on stage for the Sunday show. This is also being reported all over the gaming press and on the Basara Matsuri website so I hope that KobaP has some interesting news to share with us all. 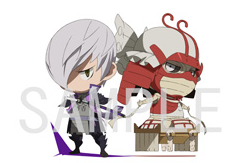 I'm not sure why it took VAP so long to add the sample picture to their site this time, but they've finally revealed how the bonus keychain from the first press version of the final DVD/Blu-ray volume of Sengoku Basara Judge End will look. Gyoubu looks more intimidating (and cute) when he's small, doesn't he? I'm not feeling well at the moment so some delirium may be contributing to this post, but what if KobaP really is announcing the next game this weekend? And what if the reason Katsuie's seiyuu is accompanying him on Sunday is because there will be an Oda theme to the game? What if that means they're going back to their roots as part of the tenth anniversary celebrations, and bringing back Nouhime and Ranmaru (and dare I hope, giving the classic characters who were only partially finished in Sengoku Basara 3 Utage proper upgrades and stories of their own)? Well, it could easily just be that Okamoto was the only one of the more popular seiyuu who happened to be free that weekend - they used Kojuurou's seiyuu to announce a few things at Kyomaf last year even though he's not all that significant in Sengoku Basara 4. The staff have said before that Sakon is popular all by himself whereas Katsuie needs more support. Still, I want to believe in my wild theory! btw, yesterday i came across this video on youtube, it's funny, informative.. I'm glad you enjoy the series too! Those videos are fun; I hope they help more people understand why the same famous historical figures have captured the imagination of so many developers (and gamers)! I actually would place a whole lot of stock in your speculation- it'd certainly make sense! I certainly wouldn't complain if the Uesugi get another stage! I'd quite like another ice-themed stage from them if Itsuki isn't coming back soon; Kenshin's stage in Sengoku Basara 3 looked lovely and it's weird not having anything similar since. Of course, this requires that Capcom actually announce another game ;_; I'm sure they're going to soon (February isn't exactly far away now...) but I've let myself get carried away about Jump Festa now! YES EXACTLY! I love ice stages! It's a shame there were none in SB4. I mean, ideally, if we were to get a new Uesugi stage I'd like it to be another permutation of Kasugayama, but hey it's a mountain I can see no reason why it couldn't be blanketed in snow. When the Uesugi team finally get their well-deserved return as characters with stories, Kasugayama would be very welcome! I liked the old version where it felt as though you were gradually making your way up. I loved it when Kenshin would appear in the frozen Kawanakajima stage, so calm and full of presence. It's still one of my favourite 'entrance' scenes; if I were a character in the game, I'd feel very intimidated. Yeah Kenshin's SB3 entrance(s) (both the freezing the river and when Kenshin jumps from atop Mt. Saijo) is /amazing/. Doesn't quite, for me, make up for not being playable in the base version, but almost! Oh my god! I love your delirium so much!!!! That would be the best outcome in the wold! I give a lot of credit to your theory.I love the oda force so much, but I dont want my dream to be crush. Well, I just want the weekend to end to know the news....I'm gonna spam your page lol. Thanks for the news and the awesome theory! If you have any crazy theories of your own, I'd certainly like to hear them! I should go to bed and get up early in time for the presentation, but I'm too excited to sleep (even though they might not announce anything at all).